In competetive sports it is necessary to develop constantly. Because of that we prioritize our research on that, and share the findings with interested athletes or institutions. Our work in competetive sports – the individual optimization of the environment of an athlete – always face us with new challenges. Accordingly, it applies innovative projects in the individual, for the sportsman essential key areas (materials development, training methodology, regeneration, etc.) to initiate and implement. The results from the research and development work flow directly into the development of each athlete of JumpandReach or we give it to interested athletes, as well as institutions. Although at the professional football field the use of altitude chambers or altitude tents is already widespread, yet there were no scientific data based on the effects of massage in simulated altitude. Project teams of JumpandReach and Univ.-Prof. GDR. Martin Burtscher of the Sports University of Innsbruck have been providing the past three years together with the support of the ÖFB (Austrian Football Federation) and in collaboration with the FC Wacker Innsbruck the first concrete scientific data and facts about the operation. After the Olympic win in 2006 we had to go new ways with Andreas and Wolfgang Linger. Since the development of the material in the bobsleighing is to a large extent up to the athletes themselves, there was the importance to make improvements on the equipment. The focus was on a plan with milestones for the “Project 2010”. Based on the sporting goals it was necessary to locate and optimize the individual success determinants. In cooperation with the Innsbruck Institute of Sports Science, a Professor of engineering faculty and two experts in the field of physics options were discussed and assessed in order to achieve a further development step in the materials sector. 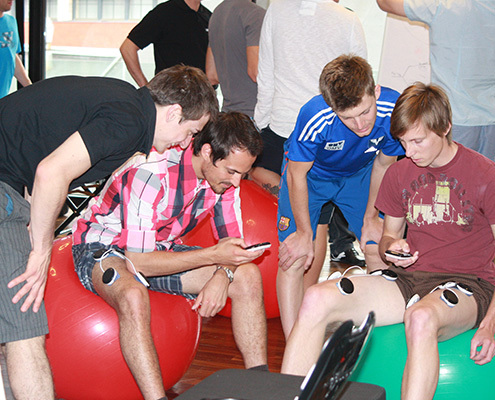 The methodology of electrostimulation is optimized continuously by JumpandReach and international experts. The focus of competence development are the regeneration and relaxation area as well as special forms of intramuscular force structure. Based on developing our specially trained specialists (JaR therapists platform) further on their skills and expertise constantly. The aim is an ongoing optimization of know-how in the operation of the equipment, as well as the purposeful use of electrostimulation for amateur and professional athletes as well as for patients with therapies and treatments.